The Millstone Trails are network of multi-use trails traversing the historic quarry lands of Millstone Hill. The trails wind their way through northern hardwood and coniferous forests and along exposed granite spines. While exploring the trails, be sure to enjoy the unique features of the Millstone areas including: scenic vistas of the Green Mountains from towering grout (waste granite) piles, dramatic quarries now filled with turquoise water, and relics from the old quarrying days. 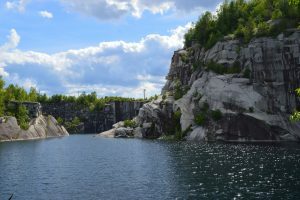 The Millstone Trails are made possible because of the generous recreational access offered by the Town of Barre and Rock of Ages quarry corporation. The Millstone Trails Association thanks these and all of our partners, for helping to make our outstanding trail network possible. Each of these three areas provide different recreational and scenic opportunities. The Barre Town Forest is home to the oldest of the Millstone Trails. Gnome Man’s Land has trails purpose built for adventurous mountain biking. The Canyonlands have the quietest and most contemplative feel. All of these area are connected and can be accessed with short road crossings.